Brahms spent the summer of 1886 at Lake Thun near Bern in Switzerland. The idyllic setting and the company of friends, the Widmann family, provided excellent circumstances for writing music, for hiking and for conversation. This summer resulted in a considerable volume of chamber music: ‘first versions’ of the Violin Sonata in A major, the Cello Sonata in F major and the Piano Trio in C minor. In the opening measures of the Sonata in A major, Hanslick heard “a heavenly bliss that flows through the first movement, and the simple theme reminiscent of the ‘Preislied’ in Die Meistersinger.” Brahms combined the slow movement and scherzo into a single entity. The finale of the Sonata is utterly Brahmsian: tenderness and happiness coexist with the darker depths of the mind. Brahms always used a great deal of time in polishing his works after completing them before he would consider publication, striving to reach an envisioned state of perfection. The Sonata in D minor op. 108 is a case in point. Brahms originally wrote it during the ‘chamber music summer’ of 1886, but it was not released until much later. The first versions of the Sonata were circulated for comment, as it were, at chamber music soirées of Brahms’s friends in October 1888. Clara Schumann was enchanted with the new work: “Such warmth, such depth of emotion, so thoroughly interesting! [...] how wonderfully woven together, like fragrant tendrils of a vine.” The enigmatic and intimate first movement is followed by a touching Adagio and a Scherzo that made Clara wax poetic: “Like a sweet girl toying charmingly with her lover, a flash of deep passion in the middle, and then flirting again.” The Sonata concludes with a dramatic virtuoso finale. In December 1888, Brahms asked violinist Jenő Hubay to visit him daily for a week to play through the Sonata for fine-tuning the score. After the New Year, Brahms ‘road-tested’ the work at Clara Schumann’s home in Frankfurt and finally performed it in public with Joseph Joachim at Bösendorfer Hall in Vienna in February 1889. Joachim probably helped Brahms finalise the violin part. 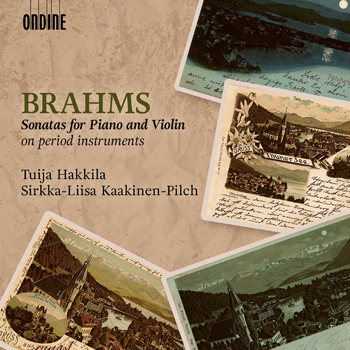 The Sonata was first published in April 1889, with a dedication to Brahms’s colleague and friend Hans von Bülow. Pianist Tuija Hakkila holds a senior position in piano music at the Sibelius Academy and earned a Doctor of Music degree in 2005. She also taught at the Royal Danish Conservatory in Copenhagen from 2005 through 2008. In 2014 she was appointed Professor of Piano Music at the Sibelius Academy. Hakkila has performed as soloist, in chamber groups and as accompanist throughout Europe, in the United States, Japan, Indonesia, Africa and, has collaborated with eminent musicians like Karita Mattila, Vera Beths, Anner Bijlsma, Mikael Helasvuo, Sirkka-Liisa Kaakinen-Pilch, Anssi Karttunen, Alexei Lubimov and performed with conductors like Okko Kamu, Jukka-Pekka Saraste, Leif Segerstam and Sakari Oramo. Her repertoire ranges from Bach to contemporary music: She has developed her interest in period instrument performance, presenting classical and romantic programmes on period pianos. She works with a number of today’s composers and is invited to give world premiere performances of new works. Sirkka-Liisa Kaakinen-Pilch is an unusually versatile violinist. Though she plays music of every era, the emphasis in her repertoire is on the 17th to 19th centuries. She also plays the viola and viola d’amore and leads the orchestra or conducts from the front desk. Kaakinen-Pilch has been active in several orchestras and ensembles, and has also worked for over a decade as leader of the Collegium Vocale. Her solo repertoire includes such works as the 16 Mystery Sonatas by Biber, the Bach Solo Sonatas and Partitas, - both works Kaakinen-Pilch has recorded for Ondine - and solo violin works of the 16th and 17th centuries. Kaakinen-Pilch has been a Professor of chamber music at Stavanger University, and a Professor of early music at the Royal Danish Academy of Music and the Bremen Institute of Arts. Currently Kaakinen-Pilch works as Professor of early music at Cracow Music Academy. She is also a teacher of Baroque violin at the Sibelius Academy, works as an instructor for the European Union Baroque Orchestra and teaches in several master classes.